An integral part of all controls installations is the 24 VAC transformer that provides power to the MACH-System controllers and peripherals. 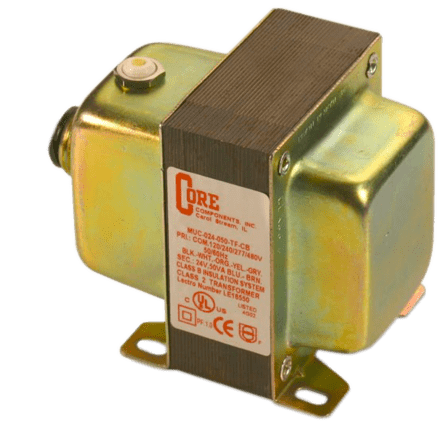 Reliable Controls has a quality, cost-effective transformer line for many different power and mounting configurations. Choose from the many models available to suit your application. Manual reset circuit breakers (MRCB). Hub and foot mounts (on selected models). Enclosed split bobbin design with steel end bells. Stripped and tinned flying leads. UL 1015 insulated 18 AWG lead wires, 8" long, .375" ends stripped and tinned. UL Class 2, Class 3, and General Purpose. UL Listed or Recognized for USA/Canada. Primary supply have multi-tap options 120/347VAC, 120/240/277/480VAC (See ordering table). Manual reset circuit breaker (some models). Thermal protection on models without external breaker. *See Specification Table for mounting hole layout. Slotted mounting holes (4): .335" x .176". *See specification table for each models weight.